Description: Would you like to know more about your beginning, your real purpose for being, and your destiny? How did you and the world around you begin? How did we become as we are today? Join Bill Hamon on an exciting journey, before time began, and behold the beginning of all things. Watch your history, present purpose, and future unfold with revelation that will thrill and fulfill the greatest longings of your soul. If God is Love, why does He allow suffering, evil, war, and death? 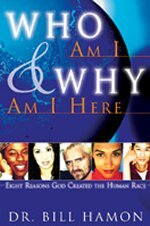 Out of the billions of people on earth, is there a special purpose and place for me? Can my life be meaningful, fulfilling, and even eternal? Why was I created with the freedom to choose good or evil? Why is Jesus Christ declared to be the Son of God and my only door to Heaven?